HP Umpire Adam Hamari ejected White Sox Manager Rick Renteria (check swing ball two call by 1B Umpire Chad Whitson) in the top of the 5th inning of the Royals-White Sox game. With none out and one on (R2), Royals batter Alcides Escobar attempted to check his swing on a 1-2 slider from White Sox pitcher Reynaldo Lopez, ruled a ball by Hamari and affirmed as ball two by 1B Umpire Whitson. Replays indicate all pitches during the at-bat were correctly officiated per pitch location; Play was reviewed and adjudicated by the UEFL Appeals Board (4-2-3), the call was correct. At the time of the ejection, the Royals were leading, 2-0. The Royals ultimately won the contest, 5-0. This is Adam Hamari (78)'s first ejection of 2018. Adam Hamari now has -2 points in the UEFL Standings (-5 Prev + 2 MLB + 1 Correct-Crewmate = -2). Crew Chief Mike Winters now has 1 point in Crew Division (0 Previous + 1 Correct Call = 1). This is the 95th ejection report of the 2018 MLB regular season. This is the 40th Manager ejection of 2018. This is Chicago-AL's 4th ejection of 2018, T-1st in the AL Central (CWS, KC 4; DET 3; MIN 2; CLE 1). 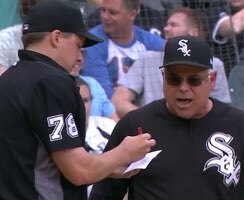 This is Rick Renteria's 3rd ejection of 2018, 1st since June 20 (Will Little; QOC = N [Balls/Strikes]). This is Adam Hamari's first ejection since May 25, 2017 (Scott Servais; QOC = Y [Balls/Strikes]).